I like tacos. You like tacos. Most people like tacos. And for some reason it has been decided that the best day to eat them is on Tuesdays. Supposedly, a Mexican restaurant called Taco John’s decided to have a “Taco Tuesday” promotion back in the 80s and trademarked the term. Since then it has become a household word combo. I guess our laziness and indecisiveness is always looking for quick easy solutions when it comes to the “what do we eat for dinner today” question. Something quick, with spicy meat, cheese, salsa, sour cream, warm tortillas, that anybody with half a brain can make it 10 minutes… oh and it’s Tuesday so it’s like an alliteration or something… I’m sold, let’s have tacos tonight! We’ll even make them with lean ground turkey so we can pretend that they’re ‘healthy’. Well, whatever the reasoning, tacos are delicious and people tend to eat them on Tuesdays. 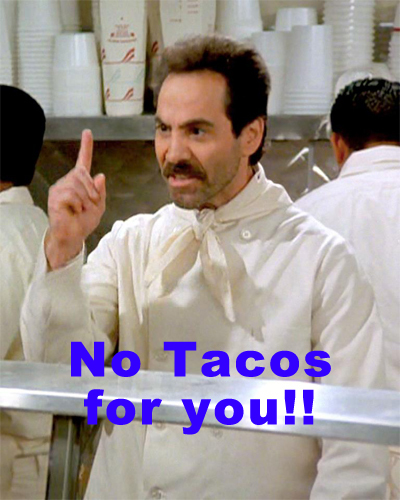 So, many Mexican restaurants in Boston honor this with taco Tuesday specials. Here’s a list of some places for you to try out this Tuesday in Boston. 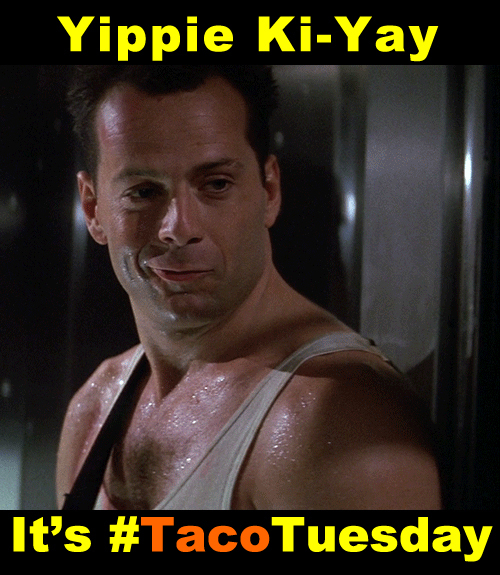 Yippie ki-yay it’s #tacotuesday! $6 for 3 tacos in the downstairs bar area. $1 chicken and beef tacos in the bar from 5pm-12. $2 tacos. Varieties change weekly, but include pork, chicken, beef, fish, veggie, or a $3 special taco. You can also get a basket of warm chips for $3.50. I’d recommend trying to make a reservation here or getting there early as it’s a popular spot on Tuesdays. Tacos are half price on Tuesdays. Normally they cost $12 for 3 large tacos so I guess you get 3 for $6, that’s a sweet deal. Ok, so they don’t technically have a “taco Tuesday” deal, but if you sit in the bar area you can get tacos for $3.75 each and a variety of tapas for $1 each. Mix and match and you’ve got a killer meal for under 10 bucks. They offer $3 tacos & Coronitas buckets after 5:00 pm on Tuesdays. This is in the location that used to be where the brick and mortar shop for The Taco Truck was, which has now gone. Ok, so there is no “taco Tuesday” deal, but tacos are only $2.25 each or 3 for $6.50 everyday, which is wicked cheap already. Again, no taco tuesday special here, but you can get 2 tacos for just $4.25 so it’s a good deal and will cure your Tuesday taco fix. $3 each all you can eat tacos with 10 different delicious fillings. I’ve eaten here and ordered some other items and I gotta say that Acitron has some awesome Mexican food. This is another popular spot as it’s much nicer than your typical taco dive so you may want to make a reservation and bring a date, if you both live near or in Arlington. They celebrate taco Tuesday ALL DAY! Get chicken, beef, or pork tacos for $2 each, or try lobster, shrimp, or fish tacos for $3 each. The restaurant just happens to share my surname, so I can not recommend it enough if you live near or in Watertown or have a car to get there. It’s also supposed to be a great sports bar with all kinds of fun events and functions too. This is another spot without an official taco discount on Tuesdays. To be honest, it’s a totally shameless plug because I just love the place. Back when I was a student at Northeastern University a large group of us would make the multiple train ride trek to the location near Coolidge Corner because it was that good. It also had kind of a soup-nazi-esque feel to it for all you Seinfeld fans. Fear not though, they’re not at all mean like that guy in the Seinfeld show, they’re perfectly nice. It’s just that there is often a long line out the door and they move so fast that when it’s your turn to order you may feel a slight nervousness to order very quickly. You say sour cream and using a wooden stick they swat down sour cream perfectly lined up in your taco, burrito, or quesadilla. Personally, I always get a chicken or carnitas quesadilla. It’s not your traditional round, flat, pizza like quesadilla. It’s wrapped up like a burrito, but grilled like a quesadilla. I’ve always been satisfied with their food. It’s fast, cheap, delicious, and the portions are large. Plus it’s just one of those only in Boston, bring your friends from out of town, kind of place. They have 2 locations in Brookline, at Coolidge Corner and JFK Corner. They’re also in Davis Square, Porter Square, MIT, and Beacon Hill. If you must know, tacos are $3.35 each, and quesadillas are $6.45 each. Well, that’s it for now. If you know of any other great places with #TacoTuesday deals in Boston, please add them to the comments section below or email them to me at brian@wickedcheapboston.com and I’ll add them to this list.